Sleep problems, such as snoring and insomnia, are signs of a sleep disorder called sleep apnea. Sleep apnea can contribute to oral health problems and dental problems can also cause sleep apnea. Learn more about the connection between sleep apnea and your oral health. Sleep apnea is a very common sleep disorder affecting 25 million American adults, according to the American Academy of Sleep Medicine. It is characterized by repeated breathing interruptions (apneas) during sleep cycles. Apneas are caused by tissue collapses of the airway related to weak airway muscles, a large tongue, being overweight, or other risk factors. Apneas prevent oxygen from reaching the lungs. Because sleep apnea disrupts the sleep cycle, this zaps daytime energy and mental performance and affects long-term health. Untreated sleep apnea can be fatal because it can cause oxygen drops, increased blood pressure, and heart strain. In addition to the above, symptoms in women include anxiety, depression, insomnia, and various sleep disturbances such as frequent wakening. Children may experience asthma exacerbation, hyperactivity, bed-wetting, and academic performance problems. Good, quality sleep keeps you healthy and reduces bad breath, mouth ulcers, and development and progression of periodontal disease (gum disease). Dental problems associated with sleep apnea include TMJ disorders, bruxism, and mouth breathing. Evidence suggests temporomandibular joint (TMJ) disorders and sleep apnea go hand-in-hand. The TMJ connects the lower jaw to the upper jaw. You have two TMJ joints, one on each side of your face. One 2013 study reported in the Journal of Dental Research found people who were more likely to have sleep apnea (based on risk factors) were also three times more likely to suffer from a TMJ disorder. The study also found people with two or more signs of sleep apnea had a 73 percent higher risk for a TMJ disorder regardless of their age, race, smoking history, or weight. Bruxism is simply a fancy name for grinding the teeth or clenching the jaw. While it can happen at any time, it frequently occurs while a person is asleep. Bruxism has negative effects on your sleep, including waking up unrefreshed and with headaches and neck and jaw pain. Research from The Journal of Oral & Facial Pain and Headache suggests bruxism may affect up to 31 percent of adults, and at least a quarter of them may have sleep apnea. Bruxism is considered a sleep-related disorder because it causes uncontrolled and involuntary movement of the jaw during sleep. It is quite possible you may not even know if you suffer from bruxism, but your dentist may discover evidence during a cleaning exam. Signs can range from loose teeth to eroded tooth surfaces, or cracked, chipped, and broken teeth. If your dentist observes symptoms, he or she may ask about muscular pain in your head, neck, face, and jaw, as well as dryness of your lips, mouth, and throat upon awakening. Sleep apnea causes a person to breathe through the mouth (mouth breathing). Mouth breathing results in dry mouth and leads to tooth decay. Additional consequences of dry mouth are plaque, mouth sores, gingivitis (gum inflammation), and periodontal disease. According to research reported in the Journal of the Indian Society of Periodontology, periodontal disease affects 62.3 percent of people with sleep apnea and gingivitis accounts for 34.1 percent of people with sleep apnea. Up to 4 percent of children between ages two and eight have sleep apnea, according to The American Sleep Apnea Association. Childhood sleep apnea comes with many health risks, including the risk to oral health, which is often overlooked. Sleep issues in children typically involve mouth breathing, which can create serious problems with their teeth and gums. Research reported in the Journal of Dental Sleep Medicine finds a link between childhood sleep issues and dental problems, including cavities and periodontal disease. Through dental exams, researchers found children with sleep disorders had three times the incidence for cavities and also had deeper spaces—up to three times deeper—created by inflamed gums. They also had more gum bleeding, tooth pain and sensitivity, and mouth sores. Be sure to discuss the above symptoms with your dentist. He or she may suggest ways to alleviate them. Your medical doctor can determine if your symptoms are related to sleep apnea or other sleep disorder. Your dentist may notice dental problems associated with sleep apnea and recommend you get in touch with your doctor. Sleep apnea is usually diagnosed by a medical doctor who will suggest corrective treatment measures, such as a CPAP machine. 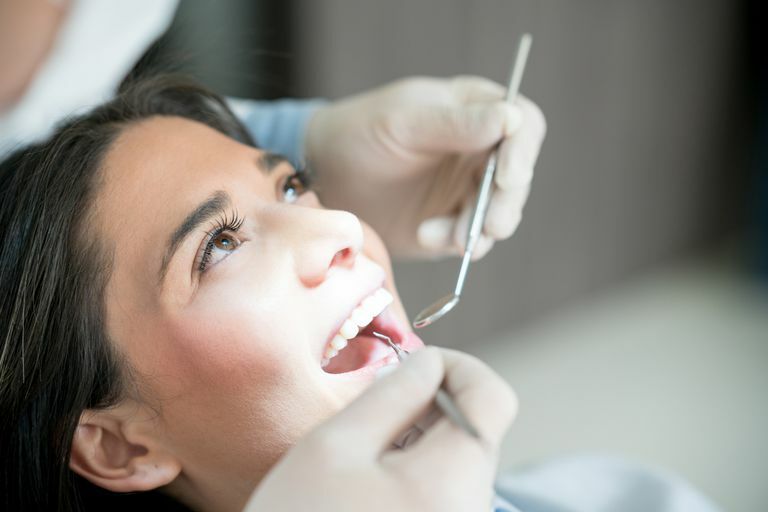 Your dentist can help you to alleviate dental symptoms through behavior modifications including improving sleep quality, managing your dental health, orthodontic treatment to repair problems with teeth misalignment, treatments for dry mouth, and/or a dental mouthpiece to manage grinding and clenching. Mouthpieces can be custom-made through dental facilities and can be quite pricey, but they are life-changing in that they can dramatically improve sleep and reduce dental problems. There are increasingly more options for mouthpieces that are accessible online and less expensive as well. Just be sure to discuss these with your dentist before purchasing. Sleep disorders affect health in many ways and a good night's sleep is important to feeling refreshed and energized as well as for your mental and physical health. If you are concerned you may have sleep apnea, talk to your medical doctor about getting tested to determine the cause of your sleep troubles. Be sure to ask about all the treatment options available, including CPAP machines and dental devices, to figure out what treatments best work for your unique situation. American Academy of Sleep Medicine. Rising prevalence of sleep apnea in U.S. threatens public health. Published September 29, 2014. American Sleep Apnea Foundation. Children’s Sleep Apnea. Latorre C, Escobar F, Velosa J, et al. Association between obstructive sleep apnea and comorbidities with periodontal disease in adults. J Indian Soc Periodontol. 2018 May-Jun; 22(3): 215–220. DOI: 10.4103/jisp.jisp_38_18. Manfredini D, Winocur E, Guarda-Nardini L, et al. Epidemiology of bruxism in adults: a systematic review of the literature. J Orofac Pain. 2013 Spring; 27(2):99-110. DOI: 10.11607/jop.921. National Sleep Foundation. The Link Between Sleep Apnea and Teeth Grinding. Sanders AE, Essick GK, Fillingim R, et al. Sleep Apnea Symptoms and Risk of Temporomandibular Disorder. J Dent Res. 2013 Jul; 92(7 Suppl): S70–S77. DOI: 10.1177/0022034513488140. Tamasa B, Godfrey G, Nelson T, et al. Oral health status of children with high risk of sleep-disordered breathing. Journal of Dental Sleep Medicine. 2018;5(2):31–38. DOI: 10.15331/jdsm.7020.